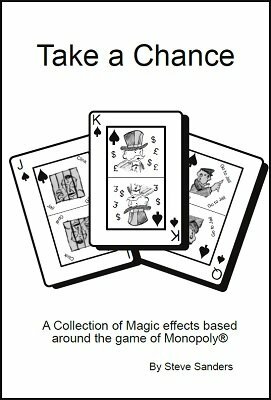 Take a Chance is a collection of five entertaining and unusual magical routines all based around the Monopoly board game. After you and the spectators mix the Community Chest cards you can decide who is going to be lucky and who will be unlucky. The spectator has a free choice of any property on the board. Yet the prediction envelope contains the correct amount of money. An Okito box routine where a little green house always finds it's way to the red hotel. Penetrating the brass box and even going through a full box of playing cards. Eventually three other green houses appear in the Okito box. One of the Chance cards is inserted by a spectator anywhere into a set of property cards. But, it was already known where it would be placed as written on the Chance card are the properties that it separated. A spectator has free choice of any of the eight tokens; the iron, dog, top hat, battleship, thimble, car or wheelbarrow. The magician divines correctly which token was secretly chosen. 1st edition 2015, 24 pages.